The party will choose from multiple candidates in the June 12 primary for governor and the state's 2nd U.S. Congressional District. LEWISTON — Maine Democrats will gather in Lewiston for their annual convention Friday, intent on energizing their voters for upcoming primary elections on June 12. The convention is expected to draw over 1,500 Maine Democratic Party loyalists with a keynote rallying speech delivered by U.S. Rep. Joaquin Castro, D-Texas, on Saturday. Castro is known for his advocacy for public schools and universities, health care and good-paying jobs, according to a release from the party. Also in the lineup will be all seven Democratic candidates running for the chance to replace outgoing Republican Gov. Paul LePage. The docket also features three candidates running to represent the party against U.S. Rep. Bruce Poliquin, a Republican seeking his third term in the 2nd District. 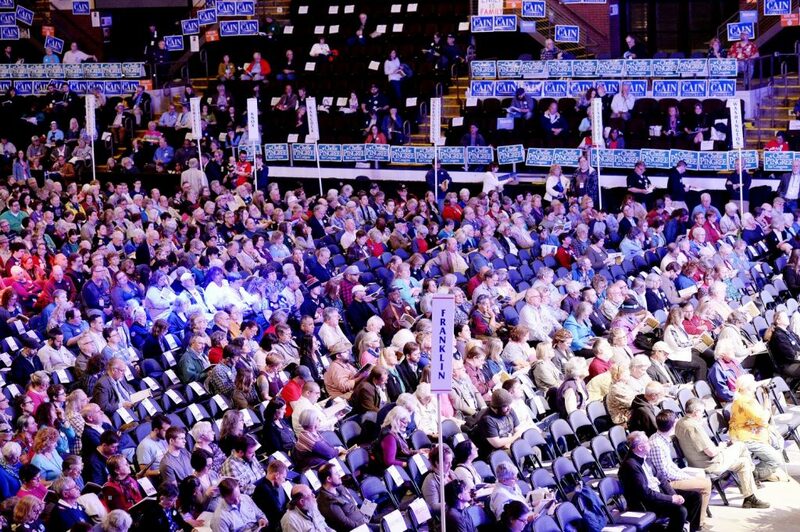 Organizers were touting the record number of Democrats pre-registered for the convention at the Androscoggin Bank Colisee in the state’s second largest city – where registered Democrats outnumber Republicans by a more than a 2-1 margin, according to the most recent voter data from the Maine Secretary of State’s Office. The Maine Republican Party held its convention at the Augusta Civic Center earlier this month. With a theme of “Victory Starts Here,” Democrats hope to retake the governor’s office in 2018 as well as capture enough seats to give them congressional majorities. Phil Bartlett, chairman of the Maine Democratic Party, said the convention will focus on Democrats’ desire to improve the economy, create jobs, expand health care access and affordability and end the state’s ongoing opioid crisis, which claims on average one life a day to overdoses. “With a record-breaking number of Democrats prepared to attend our convention, it’s clear that we have energy and momentum on our side and we are ready to elect Democrats up and down the ballot this year,” Bartlett said. The Democratic candidates hoping to replace Poliquin include state Rep. Jared Golden, a Lewiston resident and Marine Corps veteran; Craig Olson, a rare bookseller from Islesboro and Lucas St. Clair, a small businessman from Hampden, the son of philanthropist Roxanne Quimby and a key player in the creation of the Katahdin Woods and Water National monument. Also in the lineup for Friday evening is 1st District U.S. Congresswoman Chellie Pingree, running for her fifth term, and Zak Ringlestein of Portland, who hopes to unseat incumbent independent U.S. Sen. Angus King, who also faces a Republican challenger. The candidates for governor include former state Rep. Diane Russell of Portland; former state Speaker of the House Mark Eves of North Berwick; former Biddeford Mayor Donna Dion; Maine Attorney General Janet Mills of Farmington; state Sen. Mark Dion of Portland; Adam Cote, a Sanford attorney, businessman and Army veteran; and lobbyist Betsy Sweet of Hallowell. They will each take the podium for 10-minute speeches Saturday afternoon. They will be followed by Castro, who is scheduled to speak at 4:15 p.m.